Floodwaters began flowing into Australia's third-largest city Tuesday as officials urged those living in Brisbane's low-lying areas to move to higher ground. The flooding is expected to be the worst in the city's history. The Brisbane River broke its banks on Tuesday and was continuing its rise Wednesday — partly controlled by a huge dam upstream. Some streets and riverside parks were covered with water, though no major flooding was reported early Wednesday. At least 9,000 properties are expected to be inundated completely, and as many as 30,000 damaged as the Bremmer and Brisbane rivers hit record levels over the next two days. Australia is being hit hard by two concurrent weather phenomena: La Nina and monsoon season. La Nina happens when sea surface temperatures are cooler than normal in the eastern Pacific and warmer than normal in the western Pacific, strengthening easterly trade winds. Those strong winds drag warm, moist air along the Australian coastline, causing persistent rain clouds and thunderstorms. 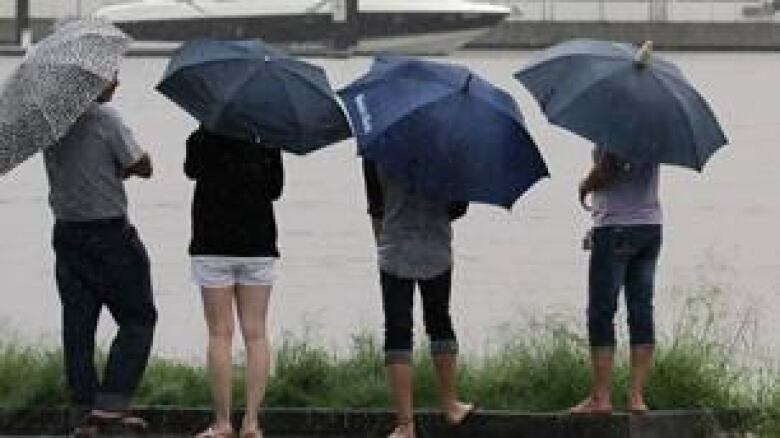 At the same time, Australia is in the early stages of its annual monsoon season, which typically begins in late December or early January and runs until April. During this season, dry easterly trade winds collide with moisture-laden northwesterly monsoon winds — also in northern Australia. The warnings come after a flash flood swept through Queensland's Lockyer Valley on Monday, lifting houses off their foundations and smashing cars into trees. Many residents were swept away while still in their homes. The valley funnelled rain from a freak storm — forecasters estimated up to 150 millimetres fell in half an hour near the city of Toowoomba — into a fast-moving stream that left a path of destruction. The raging floodwaters killed at least 10 people, including a four-year-old boy who reportedly died as rescuers tried to save him and his family. Queensland Premier Anna Bligh said 78 others were still unaccounted for late Tuesday. Emergency crews were still searching for survivors, but Bligh said she had "very grave concerns" for at least 18 of the missing. Thunderstorms and more driving rain hampered the search and rescue effort, although the bad weather eased during the day, and Bligh said the search would get easier on Wednesday. The weather "might be breaking our hearts, but it will not break our will," she said, adding "the best trained people in Australia" were working to protect communities and find the missing people. "We are going to make sure we keep everybody that we can as safe as humanly possible." Sydney-based reporter Peter Hadfield said people in the area were caught off guard, with many forced to cling to whatever they could find to avoid being swept away. Send us your photos and videos of the flooding in Australia. "Houses were crushed, picked up and carried downstream," Hadfield said, noting the torrent of water and mud has slowed as it continues downstream towards Brisbane, a city of two million people. 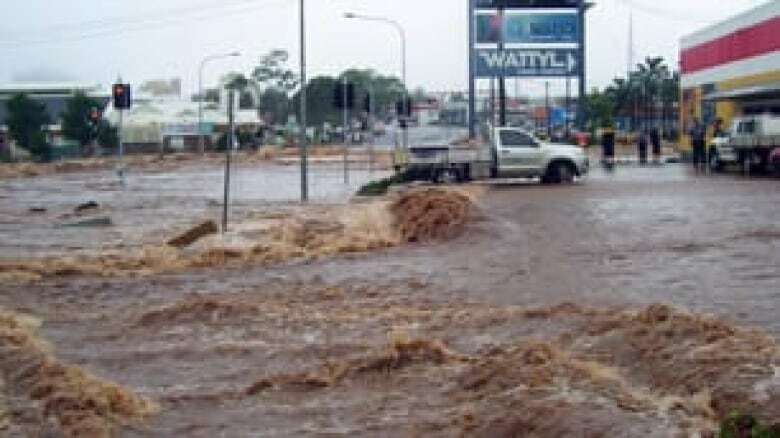 Bob Atkinson, police commissioner for the state of Queensland, said early reports suggested the flood that ripped through Toowoomba could be described as an "inland instant tsunami." The violent surge near Toowoomba on Monday escalated Australia's flood crisis in the state of Queensland. Until then, the flooding had unfolded slowly as swollen rivers burst their banks and inundated towns while moving downstream toward the ocean. "This is a truly dire set of circumstances for the people of Queensland, with more flooding to come," Prime Minister Julia Gillard said. Gillard said she had been "absolutely shocked" by television footage of Monday's flash flood. She also warned people to brace for the possibility the death toll could increase in the days ahead. "With floodwaters so dangerous and moving so swiftly, we do need to brace ourselves for the likelihood of further bad news," she said. Bligh urged people to stay calm and help their neighbours as the flooding continues. "Now is the time to be checking on neighbours, on elderly people in your neighbourhood, to be checking on family and friends," Bligh said. Brisbane Mayor Campbell Newman said the flood peak was expected on Thursday, when parts of downtown were expected to be awash. Brisbane is protected by a large dam built upstream after floods devastated the downtown in 1974. But the reservoir is full, and officials had to release water, causing low-level flooding in the city, Newman said. The alternative was a much worse torrent. The Australian Red Cross said it was setting up an evacuation centre in the Brisbane area that could accommodate up to 3,000 people. Queensland has been in the grip of its worst flooding for more than two weeks after tropical downpours across a vast area of the state. Entire towns have been swamped, more than 200,000 people have been affected, and coal and farming industries virtually shut down. Floodwaters bloated by driving rain in recent days have cut roads to several towns in northern New South Wales state near the border with Queensland. About 4,500 people were cut off, the State Emergency Services said, though the situation was not yet as dire as in Queensland.